and WHAT is that man in the middle wearing?! 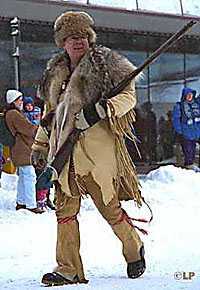 It's the Fur Rendezvous, also known as "Fur Rondy," Anchorage's February festival. And these people are watching the sled dog weight pull. 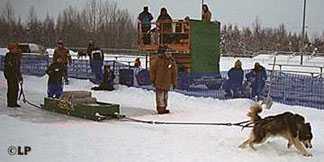 In this event, the dogs demonstrate their strength by hauling weighted sleds several yards. The weights can total 1,000 pounds or more. Alaska's fur trade isn't what it was a generation or two ago, but Fur Rondy provided parade watchers with an opportunity to see folks who "shur nuff" looked like old-time trappers. Animals that are rarely seen elsewhere are still abundant in a state one-fifth the size of the Lower 48 states but with a population of only 600,000. (Moose, in fact, are a hazard for motorists in Anchorage and there's been some talk of permitting a bow and arrow hunt of them on the Hillside - within the city limits. Wolves attacked several dogs in outlying parts of the city in the fall of 1995, and a grizzly bear was shot near downtown Anchorage a few years ago.) Some Alaskans still run traplines, and pelts as well as some unusual headgear are sold at Rondy. Children watch the passing parade in 1996. It included beauty queens in convertibles - but they, like the children, were well bundled up. More than three feet of snow fell in six days before the start of the 1996 Fur Rondy. 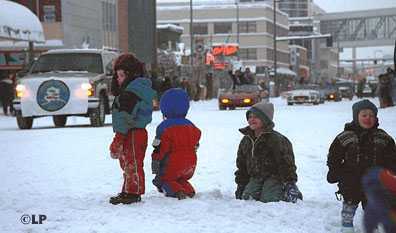 The weather was more accommodating for the 1997 and 1999 parades, which took place on days when the temperature was in the 20s and snow wasn't in the forecast. 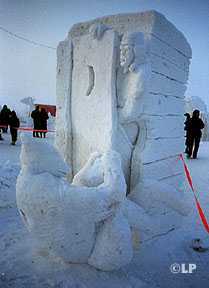 The events include snow sculptures. This one above left depicts a bear trying to break into an outhouse. The photos above are from the 1996 contest. You can also visit the 1999 Snow Sculpture Competition. 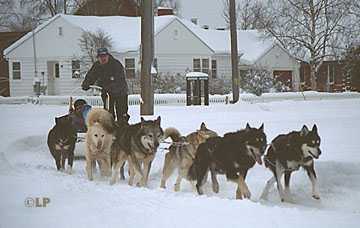 And there are sled dog rides, too, on the Park Strip near downtown Anchorage. (No, Anchorage residents don't usually travel this way.) Alaska's next major winter event is the Iditarod Trail Sled Dog Race in early March. For more information about the Rondy, visit the new Alaska Scenes site and the official Fur Rendezvous site.